These outlets serve as collection and testing centres for consumers of banks, opting for the Gold Monetization Scheme (GMS) introduced by the Government to support gold owners and jewelers in monetising existing gold assets. Our LBMA accreditation and BIS recognition as an approved refinery under GMS, assures acceptance by banks operating the GMS, as well as jewelers. Our retail outlets provide a chance for owners of gold to verify the authenticity of their gold at a nominal charge, the facility to buy back gold and also feature MMTC-PAMP’s exclusive range of minted products. 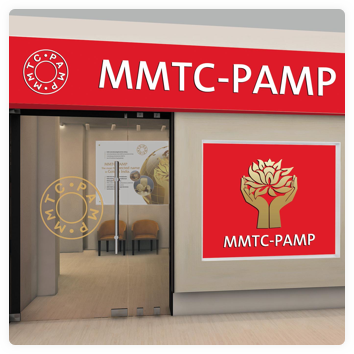 As an organization, MMTC-PAMP is driven to provide foundational infrastructure and education to the Indian customer in the field of precious metals. Our retail offices enable us to bring transparency to the customer and enable her to fully understand the underlying black box that gold can often become. Completed within a span of 45 minutes, the purity verification process operates on the principle of creating a homogenous melt. The gold purity in the sample is determined using a, high intensity X-ray Fluorescence spectrometer (XRF) that detects the presence of all metals, and where accuracy is as good as 1-2 parts per thousand. All results are system –generated and the verified purity gold is delivered to the consumer in a sealed packaging, accompanied by a certificate of its gold content.